ARP Oil Pump Driveshaft Kit UNKNOWN - Pann Auto Performance - San Diego largest aftermarket automotive performance parts - What do you drive? Many an engine has been destroyed as a result of oil pump driveshaft failure. To cure this all-too-common problem, ARP has designed an extra heavy-duty shaft that will provide you with the necessary reliability. 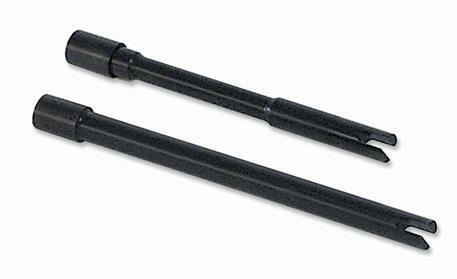 The shaft is made from heat-treated, premium grade aerospace chrome moly steel. Moreover, the shaft diameter is a larger diameter than the OEM unit. These features combine to enable ARP shafts to handle the added torque requirements of increased capacity oil pumps or heavy viscosity lubricants. Made from premium grade 8740 and heat-treated to 190,000 psi, ARP uses a unique manufacturing process where the alignment sleeve is roll formed onto the shaft (not welded or pinned), enabling the sleeve to float, allowing for slight misalignment. Made from ARP2000 and heat-treated to 220,000 psi. These pump drives feature a CNC milled (not broached) hex, and has the retaining washer installed. IMPORTANT NOTE: Make sure you ALWAYS check clearances: shaft to block and pump to distributor.